Daviesia latifolia, the Hop Bitter-pea, is a medium, upright shrub that may reach a height of three metres. The large, leathery leaves are up to ten centimetres long, three centimetres wide with a network of veins and slightly twisted. The leaves have a bitter taste (hence the common name) and recorded as having medicinal properties and have been used as a hop substitute. 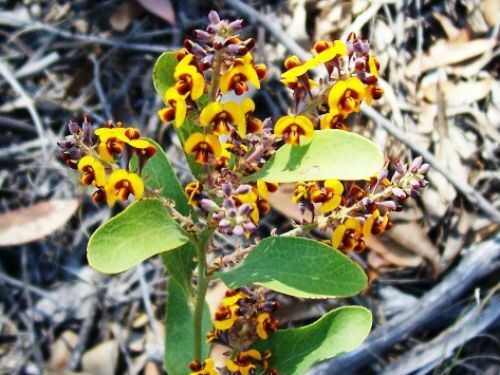 The pea-shaped flowers are yellow and brown, the typical “eggs and bacon” colours of many Australian pea species. Blooms are carried in racemes and appear in spring. They are said to be fragrant but we have not noticed this characteristic. Flowers are followed by distinctive triangular pods holding two hard-coated seeds. Daviesia latifolia is a decorative shrub that could be grown in hedges and windbreaks. As with most native peas, this species is rarely if ever cultivated. We have had a long relationship with the Hop Bitter-pea. In a previous cold climate garden, Daviesia latifolia regenerated in large numbers. We also have scattered, naturally occurring populations on our present site. Extensive roadwork on the road that passes our property has triggered a proliferation of Daviesia latifolia seedlings. The species is widespread and occurs in all eastern states including Tasmania. Daviesia latifolia may be propagated from seeds that should be treated with hot water before sowing and cuttings using fresh new growth.